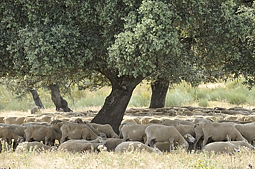 Extremadura is a great holiday destination all year round. Depending on where your preferences lie, here is a month by month overview of what's going on, enabling you to plan your holiday. Feel free to get in touch if you would like more information. It is winter. Temperatures vary between 5 and 15 degrees Celsius. Nature is at rest. The weather is changeable; rain alternates with sunny periods, making it possible to relax outside. After the sunshine, fields are studded yellow with wildflowers. It is a fantastic time for birdwatchers. Winter birds have arrived, the most spectacular of which are the 120,000 cranes who have arrived from their nesting grounds in Northern Europe. Griffon vultures start building their nests. Storks return in huge numbers and take residence. Eagle owls can be heard calling in the dusk and begin breeding. January is also a fantastic month for landscape photography. Despite bright sunny days and clear frosty nights, the approaching spring slowly starts to manifest itself. 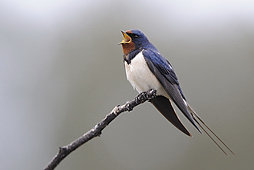 House martins and swallows return from Africa. Many birds, such as mistle thrushes, corn buntings and hoopoes, start singing. The vultures begin their breeding season. Large concentrations of winter birds are still present on the steppes; larks, lapwings and various finches. Little and great bustards roam the plains in large flocks. Many amphibians are active. Flowers, including several species of wild daffodils, slowly appear. Mimosa and almond trees are in blossom. A wonderful month for people who cannot wait for spring! It is an unpredictable month weather-wise, but not unusual for the temperature to hit more than 20 degrees. 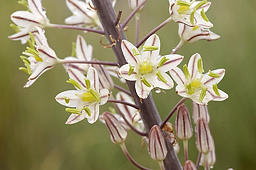 Spring has arrived with a vengeance and wildflowers - including the many orchids start to bloom. Summer birds return and birdsong is everywhere. African residents arrive: great spotted cuckoo, black kite, griffon vulture, woodchat shrike, Egyptian vulture and Montague's harrier. The first stonechats can be seen. Try to spot the difference between the pallid and ordinary swifts while enjoying a coffee in the Plaza Mayor of Trujillo. Look up and see the lesser kestrels darting above your head while the storks deafen you with their clattering bills. Great bustards begin courtship; on the plains around Caceres at dawn and dusk they are relatively easy to spot. March is a superb month for the ultimate spring experience. It is also a great time for wildlife photography. If the previous months have been rainy, Extremadura is a spectacular sea of flowers. The weather can still be changeable but days exceeding 25 degrees are common. 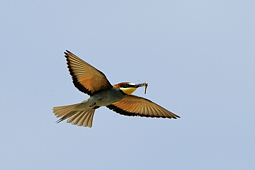 The last summer visitors arrive: rollers, bee-eaters, nightingales and booted eagles complete the picture. Little bustards begin courtship in late April and are easy to spot in the low grass. 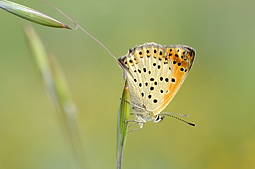 April and May are the ultimate months for the serious birder to visit, but reptiles and butterflies are also present in large numbers. 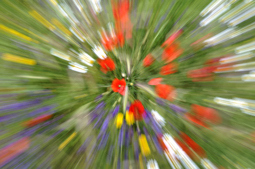 Just like April, May is a month bursting with all nature has to offer, both flora and fauna. In this month the weather is sometimes unpredictable and can be quite warm when the sun is shining brightly. An ideal month for the nature lover to visit. Despite the occasionally unpredictable weather, June is a real summer month with temperatures around 25 degrees; still a fascinating month for lovers of flora and fauna. Many birds now have hatched their eggs and are very active. 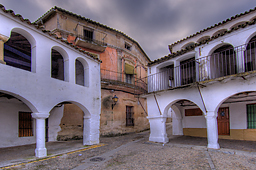 Culture lovers will enjoy the vibrancy of the many charming historic towns and villages of Extremadura. A great month for holiday makers who enjoy the mix of outdoor life and relaxation. Generally speaking this is the month with the most chance of really hot weather, with temperatures exceeding 40 degrees. Come in July to relax, read and swim. Enjoy the peace and quiet of the night by staying up until the small hours and be amazed by the immensity of the star studded skies. Come and see the Milkyway! Good weather is guaranteed! Although nature is resting, vultures and bee-eaters are still very active and easy to find. The landscape is coloured warm yellow. 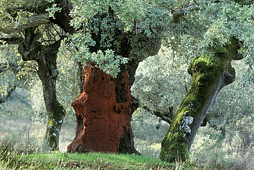 In many places the bark of Cork oaks are harvested for natural cork. The holiday month for the Spaniards. Normal life in Extremadura stops and the weather can be extremely hot and dry. Many villages celebrate their traditional fiestas during August and in cities there are various open air concerts and performances to attend. A great month for those who do not mind the heat and enjoy the relaxation of a good book, drink and regular dips in our brand new swimming pool. 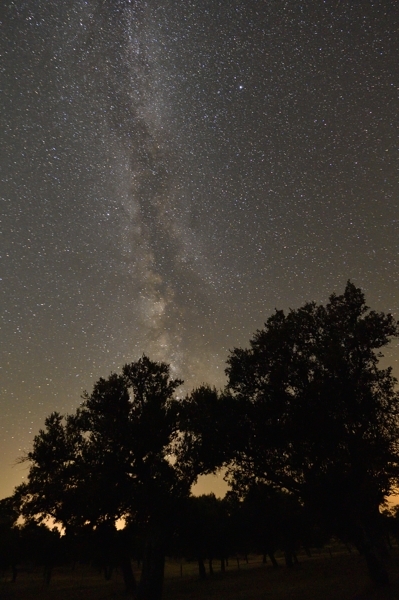 Best time to observe the Milky-way: August! September generally enjoys summer weather, but with an increasing chance of heavy thunderstorms. Although nature is quietening down, bird migration from Northern Europe continues and the stags are pumped up and looking for hinds. Rutting deer are easy to see and hear in Monfrague. For those who love the variety of culture, peace and quiet and are looking to enjoy the last of the summer weather, September is a good month to get to know Extremadura. October is usually very pleasant, with the worst of the heat gone and the cold still to come. Most of the summer birds have left for hotter climes in the south. The first winter guests, including cranes, start to arrive from mid October. The fresh green of the landscape returns after the first rains. 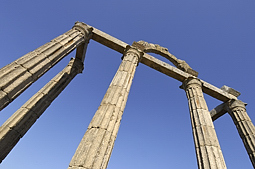 It is a super month to explore Extremadura on foot and to visit the many historical sights on offer. Autumn has arrived. 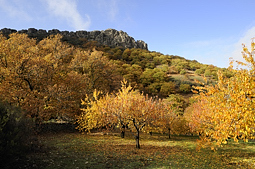 Deciduous oaks, cherries and chestnuts colour the higher grounds of Extremadura. The ferns turn a deep red brown. 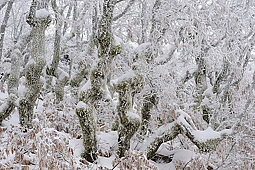 It is also an interesting month for landscape photographers. The winter birds start to return. Lapwings, golden plovers, and many small birds such as larks and goldfinches can be seen on the steppes. 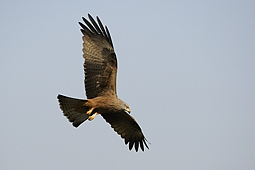 November is also a good month to spot eagles; golden eagles, the rare Spanish imperial eagle and Bonelli's eagle are easier to find. Extremadura is the place to escape from the hectic December month. Enjoy the peace and quiet, stunning nature and the many special bird species. Although it can sometimes be chilly and wet there are generally enough warm days to enjoy and, when the sun is shining, it is possible to enjoy being outdoors. The landscapes in December are beautiful and it is an interesting month for birdwatchers. The Christmas and New Year holiday is the ultimate time to recharge your batteries and to enjoy the riches that the nature in Extremadura has to offer. The best months for birders are December up to mid June. Plant and flower lovers are advised to come in the months March up to and including May. Those who love nature and are looking for peace and quiet are better off visiting in January, February and March and in the autumn months of November and December. Nature lovers who also enjoy hot weather should come in May, June, September or October. Lovers of relaxation in the summer heat will enjoy June, July or August. Bird photographers can come all year round, with the exception of mid June till September. November until April are the best months for landscape photography. If you enjoy walking, it is best to avoid the hot summer months.